Wally Baker is no ordinary girl. Living in her grandparents Brooklyn Heights brownstone, she doesn t like dresses, needlepoint, or manners. Her love of "Wonder Woman" comics and ants makes her feel like a misfit especially in the shadow of her dazzling but unstable mother, Stella. Acclaimed author Elizabeth Gaffney's irresistible novel captures postwar Brooklyn through Wally's eyes, opening on V-J day, as she grows up with the rest of America. Reeling from her own unexpected wartime tragedy and navigating an increasingly fraught landscape, Wally is forced to confront painful truths about the world its sorrows, its prejudices, its conflicts, its limitations. But Wally also finds hope and strength in the unlikeliest places. With an unforgettable cast of characters, including the increasingly distant and distracted Stella; Loretta, the family's black maid and Wally's second mother; Ham, Loretta's son, who shares Wally's enthusiasm for ants and exploration; Rudy, Wally's father, a naval officer, away serving in the Pacific; and Mr. Niederman, the family's boarder, who never seems to answer Wally's questions and who she suspects may have something to hide Elizabeth Gaffney crafts an immersive, beautifully realized novel about the truths that divide and the love that keeps us together. 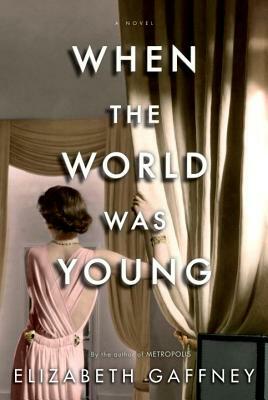 Praise for "When the World Was Young"
Elizabeth Gaffney's wonderful, richly imagined novel "When the World Was Young" cheers the power and resilience of a society-bucking young woman. "Vanity Fair"
Gaffney's heroines are brave and flawed (in a good way). "Marie Claire"
A] smart, sensitive historical novel . . . driven by fast-paced storytelling. "O: The Oprah Magazine"
Richly textured . . . Gaffney transports us. "Reader's Digest"
Gaffney provides a lovingly told story of a time and a place and a house New Yorkers will recognize, if only in the mind's eye. New York "Daily News"
A riveting coming-of-age story . . . a mesmerizing tale. "Historical Novels Review"
A charming and incisive tale . . . profound. "Booklist"
A] layered, delicate novel. "Publishers Weekly"
A smart coming-of-age tale . . . lively . . . world-wise. "Kirkus Reviews"
This compelling family drama features an intriguing cast of characters who are well drawn and realistic, while also being emblematic of their time. Gaffney's writing is graceful and leisurely paced, flavored with nostalgia. "Library Journal"
In this beautifully written novel an honest and irresistible ride through post World War II America in all its glory and its shame Elizabeth Gaffney explores mothers and daughters, upstairs and downstairs, loveless marriages and passionate affairs, without ever losing her story or the fabulous characters that inhabit it. B. A. Shapiro, "New York Times "bestselling author of "The Art Forger. Elizabeth Gaffney is the author of "Metropolis." Her stories have appeared in literary magazines such as the "Virginia Quarterly Review" and the "North American Review," and she has been a resident artist at Yaddo, the MacDowell Colony, and the Blue Mountain Center. A former staff editor at "The Paris Review," Gaffney teaches fiction at The New School and serves as the editor-at-large of the literary magazine "A Public Space."